There is a big difference between electric pressure washer and gas run pressure washer. A gasoline pressure washer creates more pressure compared to the others. SIMPSON MSH3125-S 3200 PSI 2.5 GPM Gas Pressure Washer remains within your budget while giving you the power and pressure that you require. It is really going to help you when you are planning for an arduous cleaning of your stuff. You can easily rely on its engine as the world famous company Honda has made it. The different nozzles will give you different feel in cleaning as you want. The look of the device makes you feel about its durability and while using it you will realize its good strength and performance. It creates 3200 PSI of water pressure and the power boost technology will provide high-pressure at the nozzle. The world famous company Honda and Simpson, famous for producing pressure washers, jointly made this SIMPSON MSH3125-S 3200 PSI 2.5 GPM Gas Pressure Washer where the power and performance combine together. Honda CG190 engine gives you power and Axial Cam Pump provides the perfect pressure. The motor creates 3200 PSI of water pressure and the pump distributes 2.5 GPM water flow. The device has 10 in. premium pneumatic tires to carry it wherever you want. It has OEM Technology head pump which is maintenance-free and it also has Power Boost technology which provides higher pressure at the nozzle. It is ¼ in. x 25 ft. MorFlex high-pressure hose is kink and abrasion resistant, which provides flexibility. The length of the hose is 25 foot for your convenient use. The pro-style spray gun has five different nozzles which are 0, 15, 20, 40-degree and a soap tip. For the use of the cleaners, it has downstream detergent injection system. The spray gun has a safety lock-out system to prevent any sort of accident. There is a premium OHC engine, that has high-quality components. They designed it for the optimum performance in the hardest environments. While starting the engine it doesn’t give you any trouble and starts easily, constantly. 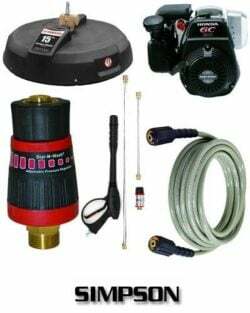 Strength: The Company designed SIMPSON MSH3125-S 3200 PSI 2.5 GPM Gas Pressure Washer for residential cleaning with a powerful Honda CG190 engine and with the Axial Cam Pump. Honda is best known for their engines which are used all over the world. The distribution of water flow by the Axial Cam Pump is 2.5 GPM. The engine creates a 3200 PSI of water pressure without any hesitation and the pressure is pretty much higher than the average pressure washers. When you are going to clean your driveway and your garden these pressure and power will count. Amiable Fuel Tank: The device has got a considerably large fuel tank that weighs 1.9 quarts. A tank-full of fuel will be enough to clean your entire house for more than one time. The 6 gauge steel tube frame and 12 gauge engine plate made the body of the device quite strong. A beautiful and convenient integrated spray gun, a 25-foot water hose and a wand hanger onboard make the cleaning task easier. Various Nozzles: Along with the spray gun the company is giving five different nozzles to meet your daily and different needs. For different kinds of cleaning provided nozzles are 0, 15, 20, 40 –degree angle nozzle and a soap tip nozzle. There is a detergent siphoning tube but only to be used for the detergent that is pressure-washer specific. Convenient Size: The size of the device is not very big so that you don’t have the problem in carrying it. It is 33 inches in length, 21 inches in width and 19 inches in height. Though the device is heavier than an electric pressure washer its weight is less than the similar kinds of gasoline run pressure washers. Its 85 pounds or 38.56-kilogram weight makes it easier to move around with. Warranty: You will get 2 full years of warranty on Honda engine, 1 year of warranty on pump and 5 years warranty on Frame items. Click to Buy it on Amazon, Now! The device doesn’t have a detergent tank in it which might be problem to some people. There is a complaint from some users that some of the component parts are missing on the shipment. And it takes around two weeks time to get them. If you are planning to go far from your home and do the cleaning then you can carry it easily with the two balanced wheels that come with the device. The product is run by gasoline and releases you from the tension of electric short-circuits and misshapes. The device uses cold water so you don’t have to worry about any other water form. There are many pressure washers options available on the market. 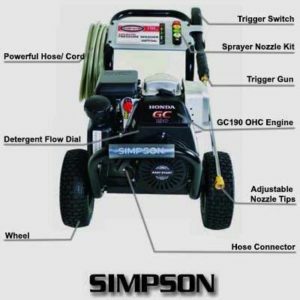 But SIMPSON MSH3125-S 3200 PSI 2.5 GPM Gas Pressure Washer will meet all your requirements. Remaining the price within your budget it gives you full support and it can be your best option. Click To Buy Now on Amazon with Latest Price!